No matter how successful entertainers become, they’ll always remember the first gig—whether it was disastrous, wonderful, or strange. Gotta Start Somewhere embraces these nostalgic moments by asking established entertainers to tell the story of the first time they graced a stage, as well as their memories of other musical firsts, from the first record they ever bought to the first concert they ever saw. For this edition, The A.V. Club talked to Ed Droste, founder of Grizzly Bear, about his early musical obsessions with Madonna and Liz Phair, and how zombie makeup helped his band overcome stage fright. Ed Droste: It depends on if I have to pick something I obsessed over, or something I arbitrarily liked as a child. I can think of a children’s song that I remember liking… I’ll just go with “Alligators All Around” [by Carole King and Maurice Sendak]. It’s basically an alphabet song—like, “B, bouncing balloons.” Each letter represents something. My parents played it for me. But I remember it being something that I learned and sang, and enjoyed very much as a small toddler. The A.V. Club: That seems like a pretty salacious show for fifth grade. Like that would make for an awkward ride home. ED: Yeah, I don’t think he knew that it was going to be like that. But I don’t remember it being super sexual. I just remember being like, “Wooo!” I think most of it just went over our heads, and we were like, “Yeah! That was fun!” We just liked all the people dancing and the pyrotechnics and stuff. Wait, were there pyrotechnics? I can’t remember. It was like 23 years ago. It’s insane, actually, to think about how long ago it was. But it was a pretty memorable show, and it’s the only time I’ve seen Madonna. And I just want to keep it at that. That was the classic Madonna tour. ED: It was UB40, Labour Of Love. On cassette. AVC: Is that the one with “Red, Red Wine” on it? ED: Yep! I liked that song a lot. I saved up for it, and I bought it on cassette, and I remember listening to it while I would take baths. AVC: Did you just listen to “Red, Red Wine” over and over? ED: No, I listened to the whole thing, but that was the reason I bought it. And I don’t even remember how I discovered it. I must have seen it on MTV or something. That was my first tape that I bought. I mean, my parents had brought other pop records into the household, like Thriller and The Bangles and stuff. But that was the first one that I went out and bought myself. ED: I don’t have it. I don’t know where the tape is, and I don’t even have CDs or MP3s of it. I should probably get it again and revisit it. AVC: You’ve lost touch with UB40. ED: I did, I lost touch with UB40. At the moment. But it doesn’t mean I don’t have fond memories of them. ED: My first true, obsessive band would be U2. I was really obsessed with them in sixth grade. But I feel like I have a much longer, more intense obsession with Liz Phair. Liz Phair was my first real obsession, where I searched out bootlegs and stuff. The most honest answer would be U2, since they really resonated with my young self. But the biggest obsession was Liz Phair. I had a few in high school I was obsessed with— Pavement, The Pixies, Liz Phair. I was obsessed with Jeff Buckley. But Liz Phair trumped them all, with The Pixies coming in a close second. AVC: Have you ever met her? Seems like you’re in a position now where you could bring that obsession full circle. ED: No, I haven’t. I don’t know where I would. She doesn’t really play at festivals. I guess I could if I actively tried to. I’m not sure that I would really want to meet her, though. I feel like I have nice, youthful memories, and maybe I should just have that. ED: Probably the song “Glory” by Liz Phair. But you know, I never actually thought of myself as wanting to become a musician. “Glory” made me want to learn to play the guitar, so I took guitar lessons in high school. But I never actually had any aspirations to be a musician in high school or college. I always wanted to be a writer. I went to school for journalism and writing. AVC: So what happened—other than the fact that being a writer isn’t as cool as being a musician? ED: [Laughs.] I was working at an audio documentary company and I learned how to use ProTools in a primitive sense, and I was feeling some of that post-college, stereotypical, cliché, “what am I doing with myself” malaise. And I was like, “Well, maybe I’ll try to record a bit at home using ProTools.” So I started tinkering around and doing a bit of recording. AVC: Is guitar the first instrument you played? ED: Technically, I played the clarinet for two years. Pretty terribly. And that was when I was in like third and fourth grade. I don’t remember a single thing about playing it. That was 25 years ago, you know, taking a lesson once a week. That didn’t stick with me. 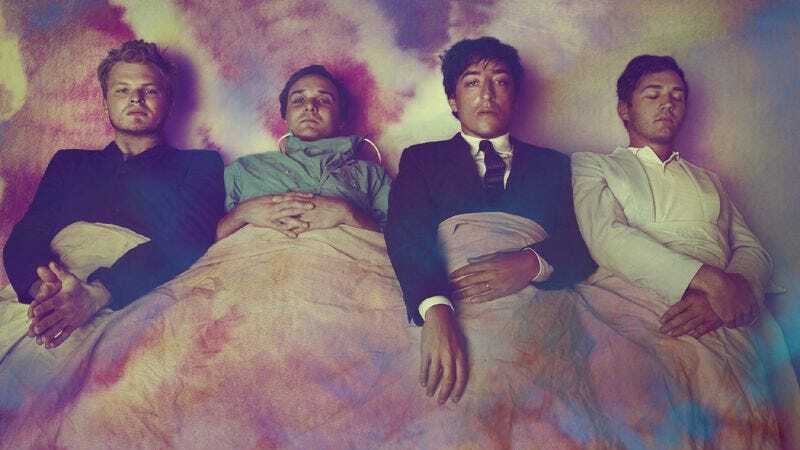 AVC: You started Grizzly Bear as a solo project, but did you try playing in any other bands before that? ED: No. I was never in a band. This is the first band I was ever in. I never actually thought I was going to be in a band. I was scared to even share the demos that I was working on. I was scared of performing. The idea of being in a band and being on stage petrified me, so yeah, I was looking for writing jobs. I wanted an internship at The Paris Review but I didn’t get it, so here we are. ED: I wrote some songs in high school that were really bad. I don’t remember what the name of the first one was, but I do remember that one was called “Stop The Train.” It was kind of a joke song, because I took the train to school every day. And I left my guitar on the train once, and I had to scream at the conductor to stop the train so I could get my guitar. Pretty terrible song. AVC: Was it Liz Phair-ish? ED: No, I don’t even know how the hell you would describe it. And I don’t have recordings of any of those songs. I do have the lyrics somewhere stored away, with the chords of them, but I can’t remember what the melodies were. But there is some documentation of their existence. I played them for a few of my friends. They were just high school-y randomness. Definitely nothing to get excited about. ED: The first time we all got together was in a basement rehearsal space in Brooklyn. We had done a couple of shows with just three of us and came to the realization that we were not that awesome as a three-piece. We needed someone else. And they were like, “We know this amazing guitarist named Dan [Rossen].” So he came, and we played for him, and he sort of jumped in and started adding stuff, and we were all really stoked and excited. And then we played with him at a gallery opening for some friends and the next thing we knew, we were booking our own tour. We did this really silly two-month tour where we played at venues and crashed on people’s couches. A good night was like 40 people. Most nights were like eight to 12 people. We were using MySpace to be like, “Come to our show!” It was pretty humorous. But it was a pretty quick way to get to know someone, if you didn’t really know them before. It was an accelerated path to becoming friends, learning how to work together and how to play together. But at the shows we would just sit and stare at the ground, and not even acknowledge the audience because we were so shy. AVC: Do you remember the first time that you felt comfortable enough to stand up at a show? AVC: Do you think it helped you to be in costume for that? ED: Yeah, weirdly it might have. We were a little bit more hidden. It might have actually been the ideal situation for us to stand since we were masked. ED: On a tour, it was TV On The Radio. ED: Oh God, uh… I remember once we opened for French Kicks. We were the first of three at The Bowery, and there were like 20 people in the audience. We had feedback the entire time. And I remember looking at the faces of the people in the audience and they were faces of horror, like, “What’s happening?” And we were like, “This hurts.” It was a disaster. Luckily there was barely anyone there. ED: I think when we were recording Yellow House. The songs started coming together and I just felt a sense of excitement about what everyone was bringing to the table. You know, we never have any huge expectations. We never expected anything to go nearly as far as it has. But that was just really exciting to record, and we were excited to tour and perform it. It was the first time that we all collectively felt really excited about what we had done together. ED: It’s so relative. I feel like these careers and the “indie” world is so very fickle. These types of careers are very fleeting. You never know when they’re going to end or when people are going to lose interest. So I don’t think we ever think of ourselves as having “made it.” You never know when you’re going to unmake it. I don’t want to think about that either. So we just don’t think about it either way. AVC: Do you really feel like you can still unmake it at this point? ED: Of course we do! You never know if you’re going to be able to make another album. You can’t have expectations. You can’t believe that you’re going to be here forever and that everyone’s going to care forever. You just don’t know. AVC: But just having produced the albums that you have, don’t you feel like you’ve already made your mark? Whatever happens from here, at least you’ve made those, and they’re never going to be unmade. ED: Yes, we do have those. And of course I’m proud of them, and I’m happy that we get to do them. But even if I knew how people’s tastes were going to change, just on a band level, I don’t know whether we’re going to be able to jump back into it and make another album that people will be excited about. Every time it’s a new process. We’re always trying to make something that’s fresh and new to us. It’s always a question mark. And we’re obviously going to try, but I don’t think anyone ever assumes that it’s just going to happen and be easy, and blah, blah, blah. You just have to enjoy what you have while you have it, and be excited that people are interested in coming to your shows and be grateful. That’s our motto: Just play it by ear and try not to expect anything.